Does Your Garage have a Pressure Washer Surface Cleaner? Most homeowners see the pressure washer as industrial or painting equipment — ideal for servicing vehicles or for a thorough cleaning before a paint job. However, a pressure washer is a handy tool for the home as well, and you might need one in your garage. Why would this be the case? Pressure washers perform a variety of tasks – cleaning driveways, walkways, garages, gutters, and dog kennels, to name a few. You can also use them to clean garden equipment, outdoor furniture, lawn movers – practically anything that is covered in heavy dirt and grime. Using an ordinary garden hose can be ineffective, and will certainly involve additional cleaning and scrubbing. Using a pressure cleaner not only saves you from back-breaking scrubbing and cleaning to remove the grime, but also gets the work done in half the time. 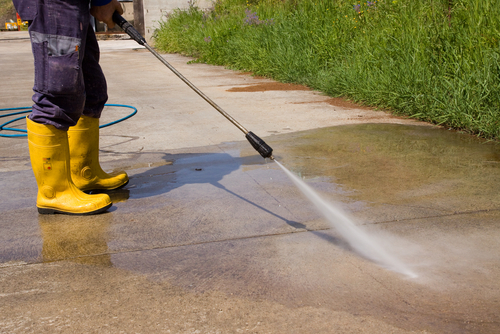 Working with a pressure washer surface cleaner is extremely easy. Start a good distance away from the spot you want cleaned and work your way closer. In addition, if you would like to increase your cleaning power, consider using a rotary nozzle. A rotary nozzle can assist in tougher jobs such as wrought iron furniture. Whether you are using it for an everyday task like cleaning out the dog kennel, or for a bigger job, like prepping the surface of your home for new paint, a pressure washer can be an invaluable tool to have around your home. Pressure washers can help you save water, money and time by cutting jobs in half and making cleaning into a simple, quick task.